Bored Cricket Crazy Indians (BCC!) - play with cricket: I was flying when Sachin Tendulkar made his 100th 100. I was flying when Sachin Tendulkar made his 100th 100. From the moment Gambhir was dismissed, I could almost smell a Sachin hundred. I could, like him, also smell the Bangladeshi bowling. 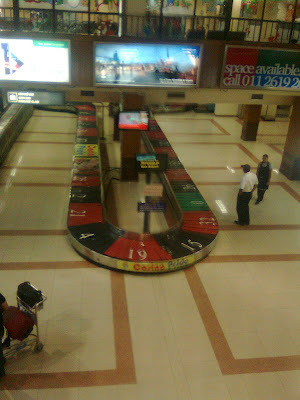 At the airport, I was watching Sachin bat on a TV perched between a baggage conveyor belt – only, no baggage there. And I thought to myself, exactly that. Sachin played on this TV, with no baggage. Then in the departure lounge, another DD cricket telecast – gotta say this new Goa government is very sorted out. By the time I was boarding, Sachin was still batting. By the time we took off, Sachin was still batting. By the time the pilot made his first announcement, I nearly jumped out of my seat. He digressed; altitude, distance, cruising – but of course, this was all a build up, nonchalant pilot was gonna round it up with, some good news folks, Sachin Tendulkar is flying on his 100th 100 cruising at…didn’t happen. Was that a sign that he had not scored it? No way any pilot would announce Sachin’s not-scoring-the-100, unless it’s Captain Chappell. Nothing. I half dozed off. Think I half dreamt. Of the captain making that announcement, and everyone going loco B-grade Hollywood passenger reaction WOOOO SACHIN! I wanted a reaction. It struck me our altitude was in the ballpark of Sachin’s runs, 35,000 no mean feat. I had the aisle seat, and some of the unoccupied middle seat – some flights you take, you really get to fly, with a single fancy. This was, I could stretch, I had extra leg room, reclining emergency seats. I was tempted to check scores midair, to check with the airhostess, make her check with the captain, again. And I was until the last game, as sick of the 100th 100s pursuit as you or him or helpless hounded airhostesses. Guess I just wanted closure. And it didn’t kill me that I didn’t get to watch it – I just needed to know. That I did. We landed, he landed. 114. The guy in front of me, types in cricket. I tell him, he’s made it.